The good news of the grand reopening of the Bogart Library on Saturday morning got even better as the ribbon cutting ceremonies progressed. “I want to thank you all for coming out and welcome you to your newly renovated and expanded Bogart Branch Library,” Valerie Bell, executive director of the Athens Regional Library System, said at the start of the ceremonies a little after 11 a.m.
Bell then introduced state Sen. Bill Cowsert, Georgia State Librarian Julie Walker, Chair of the Oconee County Board of Commissioners John Daniell, Bogart Mayor Terri Glenn, Oconee County Library Board of Trustees Chair Robert Wyatt, and state Rep. Houston Gaines, each of whom made comments. Cowsert was the first to speak, and he congratulated those present for their success in bringing about the renovation and then announced that the state budget now on the desk of Gov. Brian Kemp includes money for an upgrade of the Watkinsville Library. Wyatt, who followed Walker, Daniell and Glenn in speaking, underscored Cowsert’s announcement about the funding for the Watkinsville Library. “On Thursday, as you already have been told, we got the good news that we are in the state budget for $1.9 million to go with $1.7 million in local funds to begin construction of a new library in Watkinsville,” he said. The Board of Regents of the University System of Georgia recommended late last year that $1.9 million be included in the Fiscal Year 2020 state budget for expansion of the Watkinsville Library. The Board of Regents action followed the recommendation of the Georgia Public Library Service, which put the Watkinsville Library project at number five on a list of 13 Georgia Public Library projects for funding by the state. The Board of Regents accepted the ranking of the state Public Library Service, which is a unit of the University System of Georgia. The Georgia House and the Georgia Senate each allocated $0.95 million in state bond funding for the project. Cowsert told me after the ribbon cutting ceremony that House and Senate Conference Committee combined those figures, bringing the total figure to $1.9 million in the budget sent to Kemp for his signature. The Public Library Service listed just less than $1.1 million in local funding, but Wyatt used the $1.7 million figure based on expected revenue available in the Special Purpose Local Option Sales Tax category for the county’s libraries. Precisely how the money will be used for the expansion has not yet been determined. The bulk of the comments on Saturday were in celebration of the $2.3 million renovation of the Bogart Library, 200 S. Burson Avenue, next door to the Bogart Recreation Complex. “This is a wonderful addition to our community,” Cowsert said. “It’s great for education. It is in the public interest of everybody to have this resource to enjoy no matter what their means may be. “So I just congratulate and applaud all of you that had a part in it and I hope you enjoy using this library in the future," Cowsert said. “We are here today because someone believed that this building was a possibility and saw it through to make it happen,” Glenn said. “This day has been a long time coming, but the new Bogart Branch is here and I can tell you it is spectacular,” Wyatt said. 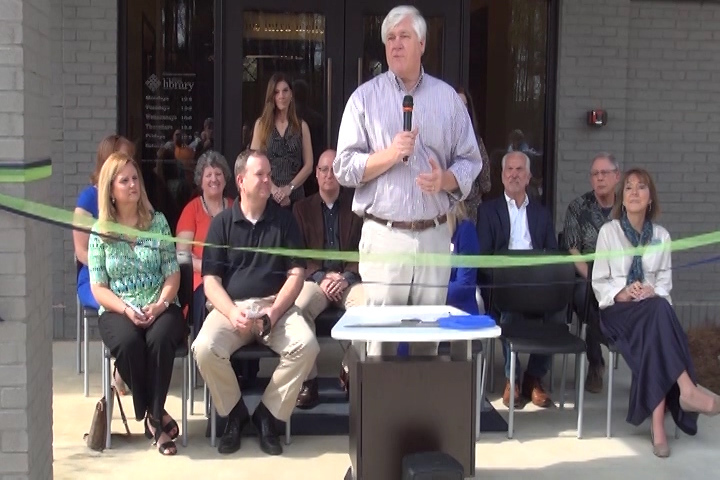 “This renovation and expansion exceeds all of our expectations and should provide new and continuing services to the Bogart community and the surrounding counties of Oconee, Clarke, Barrow, and Jackson,” Wyatt added. The renovation and expansion of the Bogart library added 5,900 square feet to the existing 3,700 square feet, for a total of 9,600 square feet. The new building is single-story, with a brick exterior and metal roof. Included is a 1,555 square foot community meeting room that can hold 110 persons. Also a part of the renovation and expansion is a 408 square foot creation studio. New windows provide views of the woods outside. The library offers computers, quiet study rooms, a dedicated teen space, and a children’s area. The video below is of the ribbon cutting ceremony at the Bogart Library and of a tour of the library that followed. I scanned the crowd with the camera just before the ceremonies began and counted 60 people. Included were Oconee County Commissioners Chuck Horton, Mark Saxon and William “Bubber” Wilkes as well as former Oconee County Commission Chair Melvin Davis. The crowd continued to grow even as the ceremony and ribbon cutting progressed, leading me to the estimate of a crowd of about 100. I shot a variety of clips of the inside and then outside of the library and edited them into a collection at the end of the video to provide a tour of the facility. The ribbon cutting and my edited tour start at 20:50 in the video.